Did you know that once you have sprained your ankle, you are much more likely to sprain it in the future? Ankle sprains can easily, and often, lead to chronic ankle instability! This means that a “simple” sprained ankle quickly becomes a progressive, degenerative condition. Degeneration needs regeneration! If you are dealing with an acute ankle injury, such as an ATFL tear, or chronic ankle pain conditions, such as osteoarthritis, our specialists want to help you. Since 1993, Caring Medical has been a leader for Comprehensive Prolotherapy (including traditional dextrose, Platelet Rich Plasma, and Stem Cell therapy) for ankle pain and helped thousands of patients. Our team has continued to publish research and improve the Prolotherapy treatment regimens used to help ankle and Achilles tendon pain from a variety of conditions, including arthritis, sports injuries, Ehlers-Danlos syndrome, avascular necrosis, tendinosis/tendinitis, complex regional pain syndrome, and more. Navigate through the sections below for lots of ankle pain information or get help from our medical staff now. These symptoms can be signs of the following ankle pain conditions caused by ankle instability that we commonly treat with Prolotherapy. 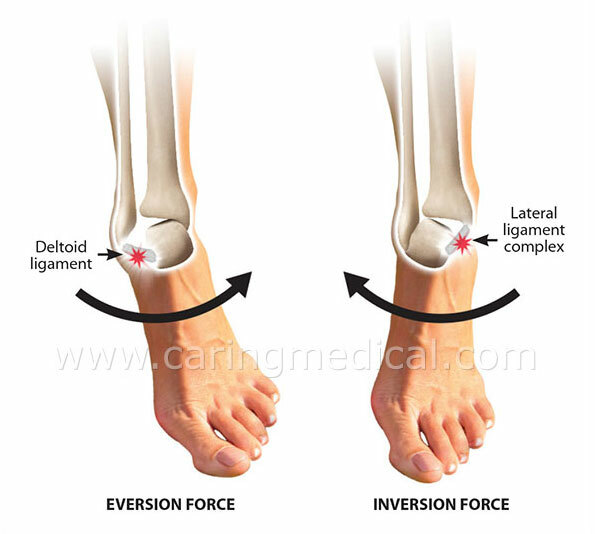 Inversion forces stress the lateral ligament complex; whereas eversion forces stress the deltoid ligament. 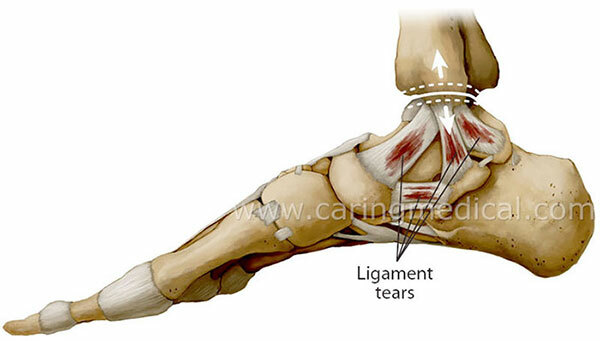 Ankle pain is most commonly due to ankle joint instability, caused by ligament damage. Since ligaments do not heal well on their own, ankle instability quickly becomes a chronic, painful condition. It allows for destructive joint motions every time the ankle joint is used, wearing down the cartilage and causing further structural damage. The stability of the ankle has to be made greater to run compared to slow walking on account of tremendous forces generated with running. Stauffer RN, Chao EYS. Force and motion analysis of the normal, diseased and prosthetic ankle joints. Clin Orthop Relat Res. 1977;127:189-196. Proctor P, Paul JP. Ankle joint biomechanics. J Biomech. 1982;15:627-634. Burdett RG. Forces predicted at the ankle during running. Med Sci Sports Exerc. 1982;14:308-316. Our providers understand the need for ankle stability to prevent the long-term damage of ankle instability. Therefore, we utilize Comprehensive Prolotherapy to restore the ligament integrity and strengthen the joint function. This prevents the continued cartilage degeneration through destructive joint motions and allows the ankle a chance to heal. Prolotherapy, in simple terms, stimulates the body to repair painful areas. It does so by inducing a localized, mild inflammatory reaction in the weakened ligament and tendon attachments. Since the body heals by inflammation, Prolotherapy stimulates healing. This can include traditional dextrose Prolotherapy and sometimes combined with Platelet Rich Plasma (PRP) and/or Stem Cell therapy, as these are all types of Prolotherapy. For ideal results, the ankle must be treated comprehensively, meaning this is not just a one or two injection treatment. At Caring Medical, one of the reasons our Hackett-Hemwall technique is sought is due to it addressing more weakened areas per treatment than the average PRP/Stem Cell/Prolotherapy doctor who gives only one or two injections. Chronic ankle sprains have been effectively eliminated with our Comprehensive Prolotherapy treatment series, usually taking just a short series of treatments for most patients to obtain long-term results. A physical examination and consultation with one of our Prolotherapists can identify the areas of the ankle that are most unstable and need treatment, as well as which Prolotherapy solution is best for your particular case, and approximately how many treatments should get you back to where you want to be. Excessive movement or soft end feel compared to non-painful side while inverting ankle is a sign of lateral ankle instability. In our retrospective observational study of chronic unresolved ankle pain, Hackett-Hemwall dextrose prolotherapy helped promote a measurable decrease in the pain and stiffness of the treated joints and improvement in clinically-relevant parameters. The complete study and results can be read here: Hauser R, et al. Dextrose Prolotherapy injections for chronic ankle pain. Practical Pain Management. 2010;70-76. Kristle Lowell, Double-Mini Trampoline World Champion, diagnosed with EDS was experiencing severe instability from multiple ligament injuries of her left ankle and received massage, physical therapy, cortisone and NSAIDS, from which she saw no long-term relief. In order to inhibit menstruation from interfering with training, she went on birth control pills, which caused a worsening of symptoms. Kristle suffered a career threatening injury to her ankle, which made gymnastics training unbearable. She came to Caring Medical and received 2 PRP Prolotherapy treatments, and discontinued the birth control pills. Her ankle was stabilized, enabling her to compete and place second in national championships and qualify for world championships. Cortisone, NSAIDS, PT and MT do nothing to strengthen the ligaments of an unstable joint. Prolotherapy strengthens the injured ligaments and stabilizes the joint. Estrogen in birth control pills inhibits the fibroblastic proliferation necessary for the healing of ligaments. Fibroblastic proliferation is the mode of healing by which Prolotherapy repairs. JS was diagnosed at age 13 with Crohn’s Disease for which she had been prescribed Prednisone over numerous years. At age 34, she began experiencing pain, swelling, achiness, crepitus and burning in the ankle, and was diagnosed with avascular necrosis of the talus, for which her orthopedist recommended fusion surgery. JS decided instead to seek out Prolotherapy. After 5 treatments of Bone Marrow to the joint and Prolotherapy to the ligaments, her symptoms resolved, enabling her to walk on a strong, pain-free ankle. Long-term anti-inflammatory use with corticosteroids makes it more likely a person will experience joint degeneration and ligament laxity, even to the point of causing bone death or avascular necrosis. In such scenarios, Prolotherapy should be sought as early as possible to resolve the condition. JM complained of a "protruding marble" on his Achilles. He had received surgery with a screw insertion after rupturing his Achilles tendon 18 years prior. The Achilles pain returned and made walking almost impossible. An orthopedic surgeon recommended surgery to remove calcium deposits, but JM sought Prolotherapy instead. Ultrasound showed small tears in the Achilles, with separate “pieces” of calcium deposits. After just one treatment of PRP Prolotherapy under ultrasound guidance, the pain resolved and the calcium deposits were broken up and reabsorbed. While the average patient needs a few treatments, sometimes only 1 or 2 are needed. 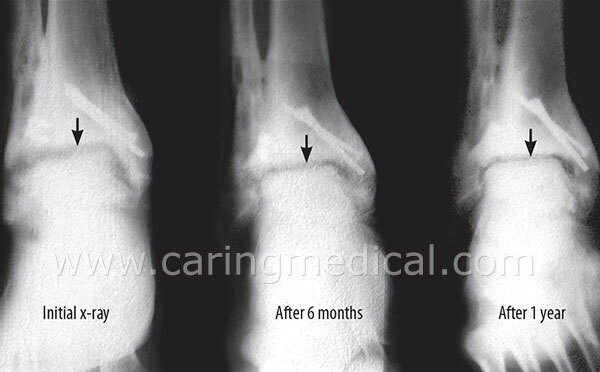 In this case, only 1 comprehensive PRP Prolotherapy treatment was needed to successfully remove calcium buildup in the Achilles tendon and alleviate the pain, without the need for another surgery. JC came to Caring Medical, approximately 1 month after spraining his ankle. Although he was not experiencing severe pain, the ankle became weak and greatly limited his ability to exercise. He had suffered chronic ankle injuries in his 20s and knew that the statistics for re-injury with ankle sprains are very high. As a runner, now in his early 50’s he did not want to chance further injury or eventual ankle surgery, and he really wanted to get back to running strong. After 5 treatments with Prolotherapy and Platelet Rich Plasma, he was able to return to trail running 16 miles without any pain or weakness. JC said he felt better than he did in high school! The chance of re-injury to the ankle after an initial sprain is very high, especially when it is a few weeks out and activity is still limited due to pain or weakness, and/or the ankle swells, subluxes, or feels unstable. It is the ideal time to start Prolotherapy before further joint damage is done and the ankle joint starts quickly breaking down and the person loses the ability to walk and gets severe ankle arthritis. NA had been dealing with chronic Achilles tendonitis for more than three years prior to being seen at Caring Medical. At 40 years old, he was normally very active, but had to stop running and playing tennis due to pain. After the first two dextrose Prolotherapy treatments, he saw improvement in daily pain levels but he still had pain with exercise. NA was advised to wear a boot for two months while we continued to treat with the addition of Platelet Rich Plasma (PRP Prolotherapy) for his following four treatments. After the series of treatments, he reported significant improvement which was also visible when viewing the tendon under ultrasound! Pain is a progressive disorder. The longer a person waits to receive regenerative treatment, the more time is lost and the worse the tissue injury becomes. Thus, many patients with severe ligament or tendon degeneration who want to play higher level athletics require a few treatments to regain enough strength in the tissue to function well in sports. Sometimes a boot becomes necessary between treatments while the tissue heals. However, even when a patient needs 6-8 PRP Prolotherapy treatments, or needs to temporarily wear a boot, it still beats needing surgery or having to stop sports altogether! JM complained of a “protruding marble” on his Achilles. He had received surgery with a screw insertion after rupturing his Achilles tendon in nearly two decades prior. His returning pain made walking almost impossible. An orthopedic surgeon recommended surgery to remove calcium deposits, but JM sought Prolotherapy instead in hopes of avoiding another surgery. Ultrasound showed small tears in the Achilles, with separate “pieces” of calcium deposits. After just one treatment of PRP Prolotherapy under ultrasound guidance, the pain resolved and the calcium deposits were broken up and reabsorbed. PRP Prolotherapy can successfully remove calcium buildup in the Achilles tendon without the need for surgery. While most patients need more than one treatment, there are patients who have curative success after just one. SH injured her ankle while training for a half marathon when she was 26 years old. She developed pain and swelling during her run that caused her to start limping. After resting for a weekend, the pain and swelling continued with long distance walking. She was seen at Caring Medical for two treatments of H3 Prolotherapy while modifying her training schedule. Four months after her first treatment, she reported a pain free ankle and was back to training! Sometimes it is really as simple as a couple Prolotherapy treatments, done soon after pain develops. The goal of H3 Prolotherapy is to stimulate enough tissue repair that the person can engage in athletics for the rest of their life, if they choose. Modifying training for the short-term, especially for runners, and working back slowly to being able to run outside on concrete is worth it for being able to keep running for the long-term. Tissue repair does not happen overnight, just like if we break a bone and need to wait for it to heal before putting it back to full use. Over time, the tissue continues to strengthen if the person is using smart training techniques. A Prolotherapist is a great doctor to have when you’re an athlete! IG suffered with chronic ankle pain for more than 30 years after undergoing surgery for fracture. By his early 50’s, the pain had increased to the point of not being able to stand or walk at times. This was a terrible problem because he and his family relied on him as the primary provider, and he had a very physically demanding job as a builder. He experienced constant pain and swelling which would also interrupt his sleep. IG tried wearing braces which did not give enough support. He was diagnosed with osteoarthritis per his X-ray imaging but was not given any recommendations for treatment prior to being seen at Caring Medical. Due to the amount of degeneration present from years of instability, a comprehensive approach of Prolotherapy and Platelet Rich Plasma was recommended. IG reported improvement with each visit and needed a total of 6 visits to reach his goals. At his last visit, the pain was no longer constant or waking him up at night. IG may require maintenance treatments once or twice per year but if he wears supportive shoes and continues the recommended preventative exercises regularly, he should be able to avoid further surgery. Any force strong enough to break a bone will also cause excessive stretch to the surrounding ligaments. 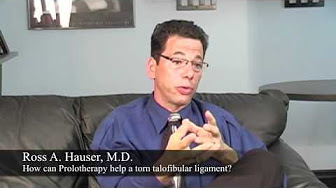 Unfortunately, ligaments heal poorly on their own due to lack of blood flow. The body’s only other defenses are to swell and slowly overgrow bone to cushion and try to fuse the joint. Prolotherapy is the only treatment to tighten overstretched ligaments because it causes an influx of blood and healing factors directly at the injured site. If, after the fracture is healed, the person experiences ankle weakness, pain, or instability, Prolotherapy should be started sooner rather than later. It generally requires fewer treatments with better functional results for the patient the sooner Prolotherapy is started. The following areas in the right ankle joint and its medial and lateral bony attachments were injected with a 15% dextrose, 0.1% procaine and 10% Sarapin solution: medial and lateral malleolus, talus, navicular, calcaneus, cuboid, and calcaneus, deltoid, plantar calcaneonavicular, talonavicular, anterior and posterior tibiofibular, anterior and posterior talofibular and calcaneofibular ligaments. A total of 36cc of solution was utilized in 22 separate injections. When MD came in for her second visit, she was pleased to report that her ankle felt stronger and more stable. She was able to be up on her feet for longer periods of time without pain and she could now walk about a half mile without pain. At her third visit, MD enthusiastically reported an even greater improvement. She was back to hiking up to three miles on hilly, uneven ground and she said that there were several days over the past couple months where she had absolutely no pain in her ankle. On her fourth visit, she reported being able to do activities of daily living without pain and could hike most days without any pain. She could now hike longer, more often, and go up mountains. Only with extreme strenuous hiking did she have symptoms. On physical examination she had only very minimal tenderness in the medial and lateral ankle ligamentous attachments and her active range of motion was as follows: dorsiflexion 15 degrees; plantar flexion 30 degrees; subtalar eversion 12 degrees; and subtalar inversion 16 degrees. She now walked, jumped, hiked, and ran with only minimal symptoms. She was phoned six months after her last visit and stated her pain on a 0 to 10 scale was 1 was aggressive activity, but had 0 pain with normal daily activities and no pain at rest. Her ankle swelling has completely resolved. She had no limitation of activities and has resumed aggressive mountain hiking. She is on no pain medication. Read the entire case report here. This patient received several lipoaspirate Prolotherapy treatments between x-ray studies. The studies showed a gradual improvement in the ankle joint articular cartilage (arrows), which correlated to reduced pain and range of motion improvement. How well do you understand the cause of your ankle pain? Read about treating ankle pain with Prolotherapy in our free E-book, Prolo Your Pain Away! Curing Chronic Pain with Prolotherapy, 4th Edition. This edition explains all about Prolotherapy and how it is used to permanently alleviate pain from arthritis, sports injuries, and all types of chronic pain conditions! Plus, it takes an expanded look at the medical literature and patient studies on Regenerative Medicine: Prolotherapy, Platelet Rich Plasma, Stem Cell Therapy, and more! You deserve the best possible results from your ankle pain treatment. Let’s make this happen! Talk to our team about your case to find out if you are a good candidate.